We want you to share your GoWalk experiences with us and suggest improvements that would help pedestrians in the town. Tell us what you love most about walking round Dumfries. 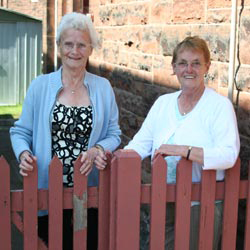 Send us your photos of you enjoying out walking around Dumfries so we can put them up on the website. Give us your suggestions for what could be done to improve walking around Dumfries. 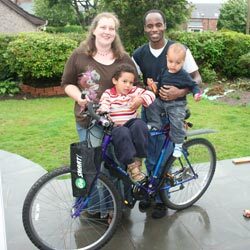 "My challenge was to walk along the cycle paths with my children. Living in Maxwelltown we can get to the Maxwelltown Cycle path easily. It was a lovely walk down there; Sam enjoyed spotting the wild flowers. The cycle paths are easy to use and safe for me to walk along with my two toddlers. I am trying to keep walking as much as possible with my kids, they really enjoy being out in the open and exploring." I walk to and from work every day because it keeps me fit. I also like it because it saves me money. My work can be quite stressful, and I find the walk home gives me time to de-stress. I wouldn't consider using the car, and walk in all weathers- if it is raining, I take some waterproof clothing and an umbrella. "Walking helps me keep fit and strong. The Walking Works group is fantastic. I'm on my own, so I like the company, I like to meet people. We have wee social nights too, and have a coffee after our walk. It gives you a motive for getting up in the morning!"